So I won't bore you with the details on lists. 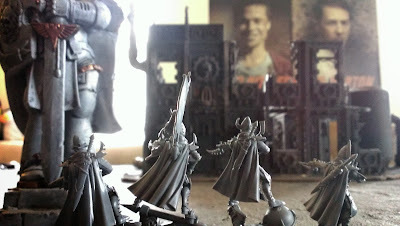 The main concern wasn't to challenge myself in terms of constructing a list for either army. I mainly wanted to develop a fun list out of guard that was capable, and I ran what I could so far from my Dark Eldar, allying in a few units of Ghost Warriors from the Eldar models I have on hand. 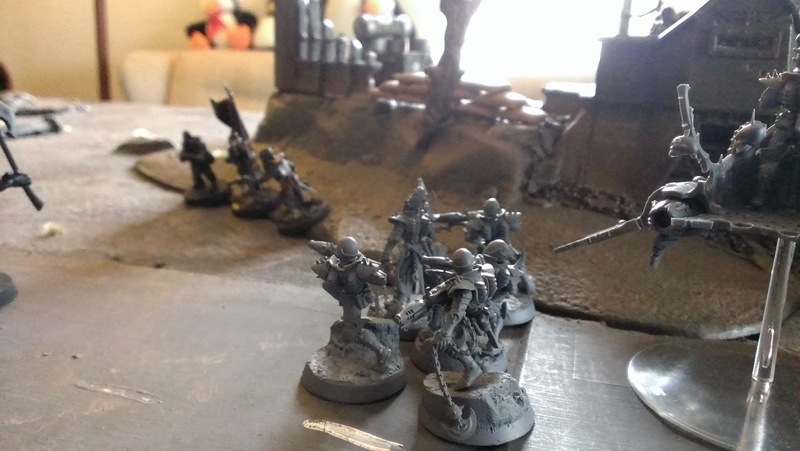 So first off the Imperial Guard Death Korps managed to not only secure the defensive position in the ruined city, they also managed to act faster than the agile denizens of the place between places. Setting up to take the bastion, the Imperial forces form up to advance across the exposed midfield to take the fight to the enemy. The cover of darkness would aid them as much as the enemy. Even with the darkness shrouding the field, it is nearly impossible to mistake the looming figure of the massive xeno construct as it trembles the ground with it's stride. Meanwhile the shadowy figures in the dark advance through ruins of a once vast hab structure. 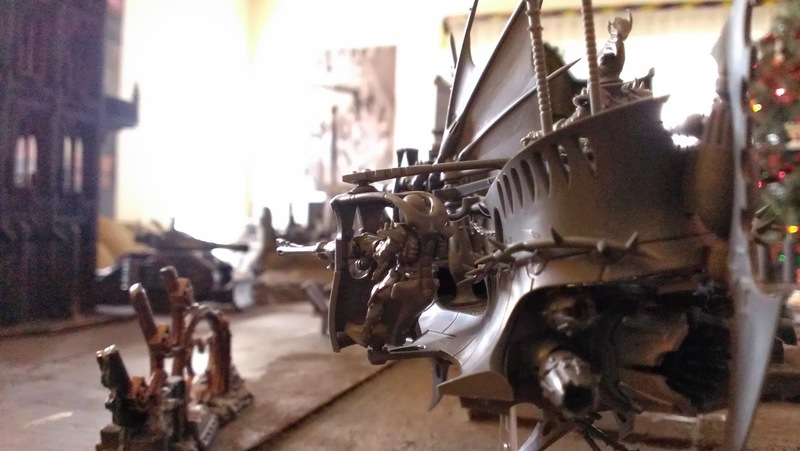 Using the cover of the Imperium's abandoned fortification, a Ravager slips into the battle zone unnoticed by the witless humans. Utilizing it's impressive speed, the Bane Wolf Jurten's Wrath moved into position, covering the smaller (relatively speaking) wraith constructs with a weaponized cocktail of poisonous and corrosive chemicals. While two of the Wraithblades were felled by the attack, the other three struck were able to shield themselves with some form of immaterial defenses. Meanwhile the rest of the troops moved forward, securing a lost piece of Archeo Tech from a downed Aquilla lander. 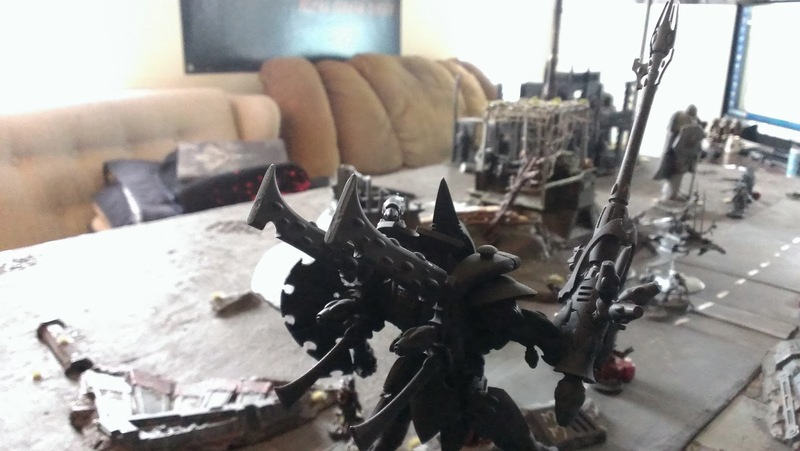 Although the attack was a success, the Dark Eldar Trueborn armed with several dark-light weapons were prepared with a counter attack, ready to avenge their (albeit already dead) craftworld allies, turning the once powerful tank into a molten pile of slag. With the cover of darkness still covering it's presence, the Ravager moves into position, launching a volley of dark-light fire into the side of the Leman Russ Punisher. While the shots connected with the hull, the durable chassis was able to soak up the shots, While still alive, the shots disoriented the crew preventing it from making an accurate strike against the Wraithknight. Without warning, in the same moment the dark-light energy was unleashed on one side of the battlefield, a hail of azure-colored energy blasts erupted from the ruins thought to be abandoned by the Imperial forces. 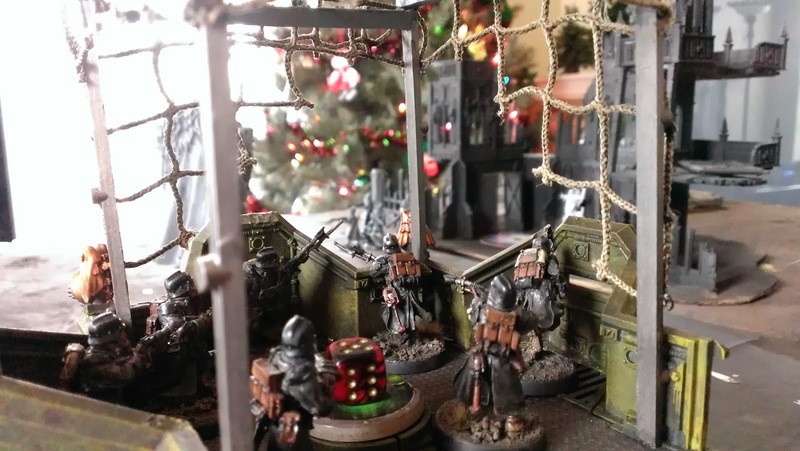 Instead of sprinting towards a forward position, the Death Korps Engineers fell into the xenos' trap, suffering 80% casualties to a single volley. Adding to the issue, a grotesque figure opened a rift into the nothingness of the webway. 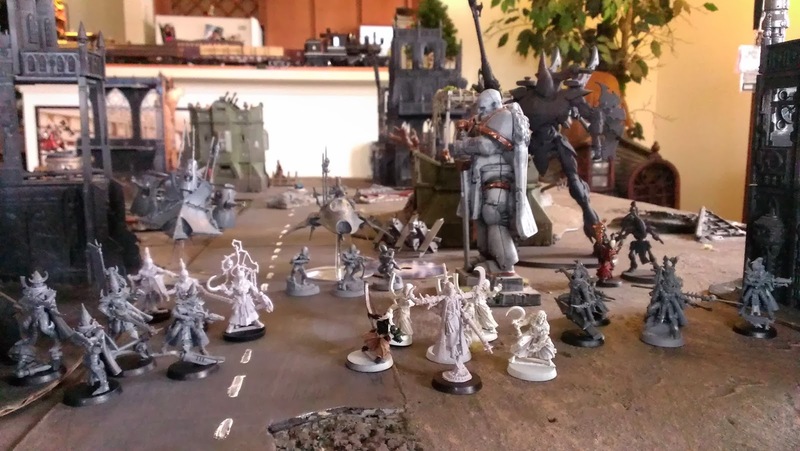 With several outlines of more of the dark kin looking in the haze of the tear in reality, the Imperial forces redirect their advance towards the center of the field. The two remaining Engineers, though resolute in their will to strive on, could not advance under the enemy fire, which pierced the armor of their squad mates, leaving them screaming in agony as they bodies were torn asunder. The survivors took to the ground near the old road, hoping the God Emperor would extend his hand and shield them from the onslaught to come. As the sun rises, the full extent of the Xeno incursion is revealed to the Imperial Company Commander in the ruins of the large Basilica. 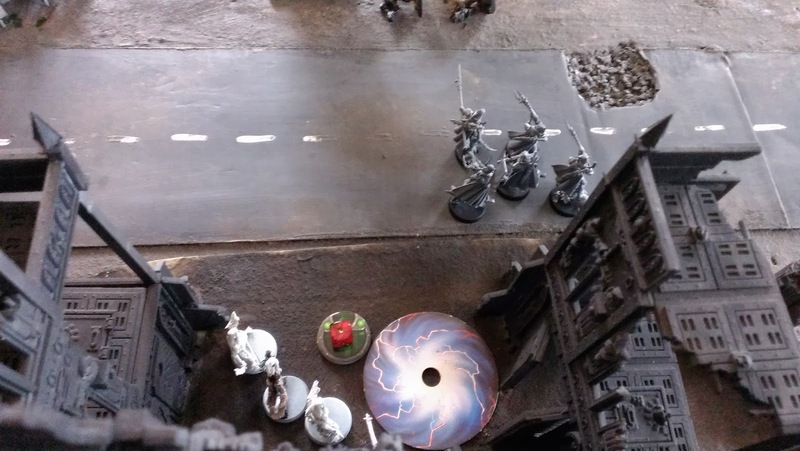 With the Wraithknight having moved forward and unleashing a barrage of fire on the Grenadier unit nearby, the Command unit was on it's own to deal with the hellish wracks moving up from behind the bastion. 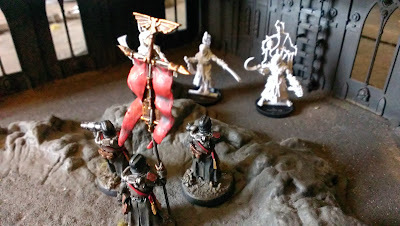 With the Command system in disarray, the ground forces of the Imperial Guard take aim at the remaining wraithblades, hoping to wipe out the xeno constructs protecting their seer. Though The xeno unit was caught under an impressive volley, the unit was not hit as much as it could have been due to miscommunication in the ranks. 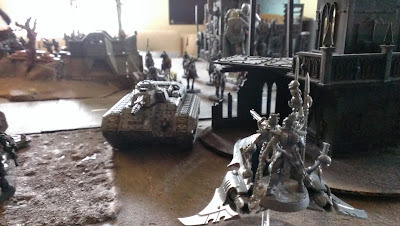 As the unit was about to fire, the Death Riders advanced mid field towards the large construct hoping to shore up the defenses against it with the Leman Russ Punisher out of commission. The Infantry unit was able to down one of the Wraithblades, but otherwise leaving the unit relatively unharmed. With the advance on the Wraithknight, the Death Korps were able to nearly fell the construct, but in the aftermath of the charge, it stood, bent but unbowed. Although severally damaged, the huge construct crushed several of the imperial forces, keeping the two units tied in combat. With the Death Riders out of the way, the Wraithblades, led by their seer moved up on the Infantry squad. 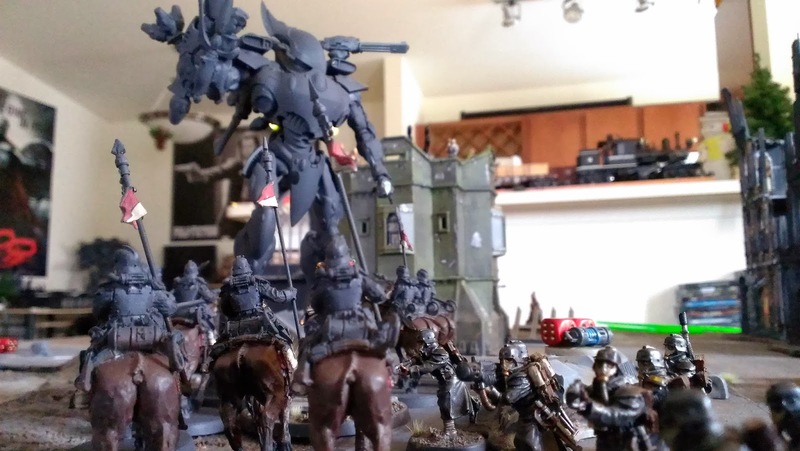 Manifesting some power, the resolute will of the Death Korps denied the witch powers of the Eldar. 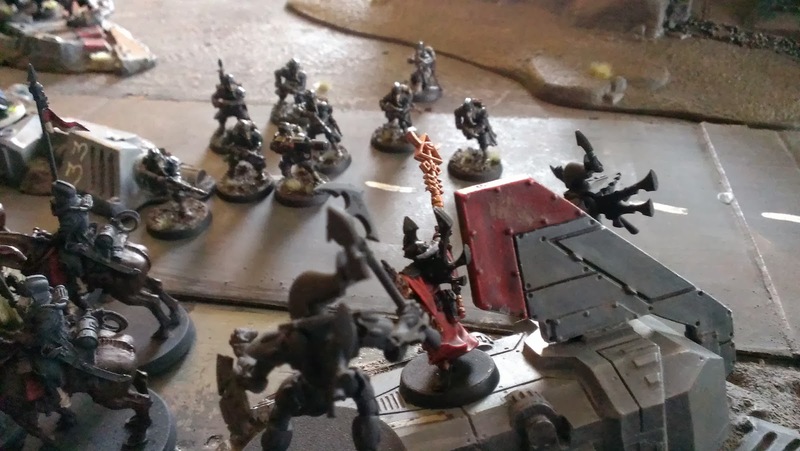 While it was a victory over the mind of the xeno, the sheer might of the Wraithblades was more than enough to crush the unit. 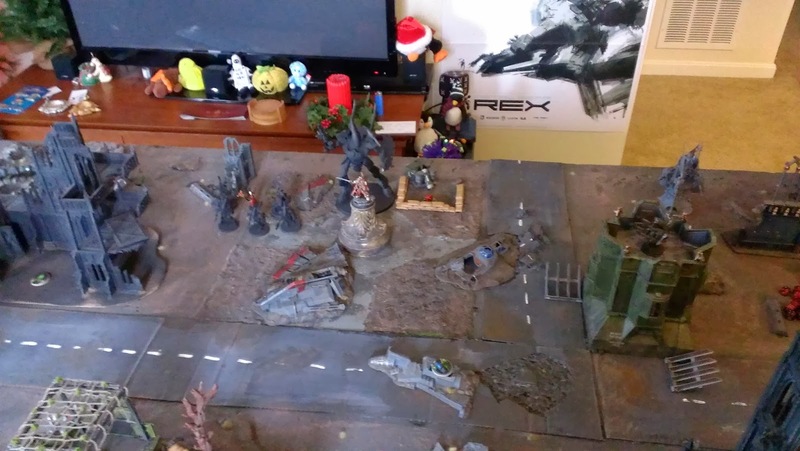 With the Imperial forces bunkered in, and most of their central forces either engaged or crippled, the Dark Eldar continued to press their advantage. 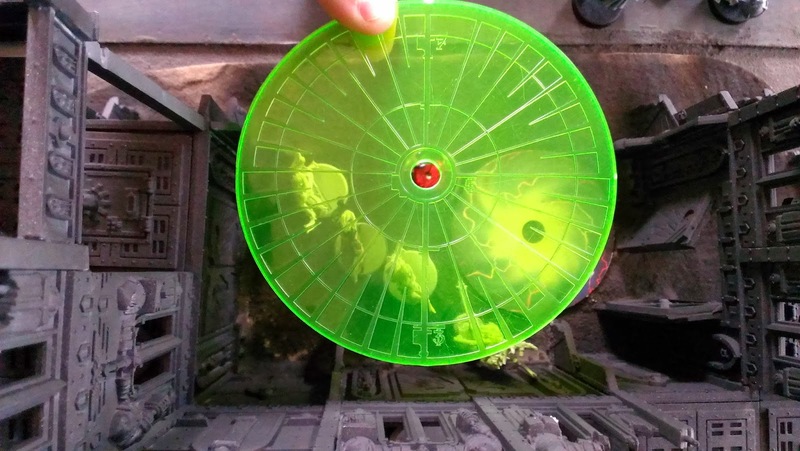 The Ravager relentlessly pursued the Leman Russ around the Basilica, hovering atop the bastion, and placing a single penetrating hit, clipping the ammunition stores and detonating the hull of the once mighty tank. With the primary enemy engines destroyed, the Ravager was now free to harass the enemy even further, allowing it's crew to disembark and gather more slaves. Out from to tear in reality, slipped five sinister Kabalite Warriors, ready to support their shade-like brethren and collect more prisoners. 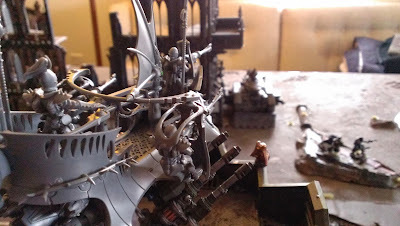 With their support, the hab structure was secured for the Dark Eldar. Firing on the Imperial heavy weapons platoon in the old refinery, the mandrakes annihilated the remaining engineers. The Imperial Guards left flank had fallen, and the first jaw of death began to close around their forces. 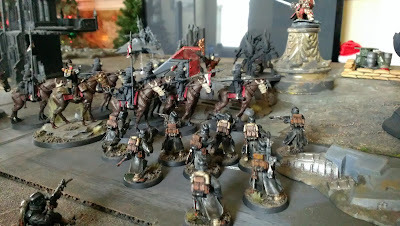 Still undeterred, the Death Korps continued to fight on. 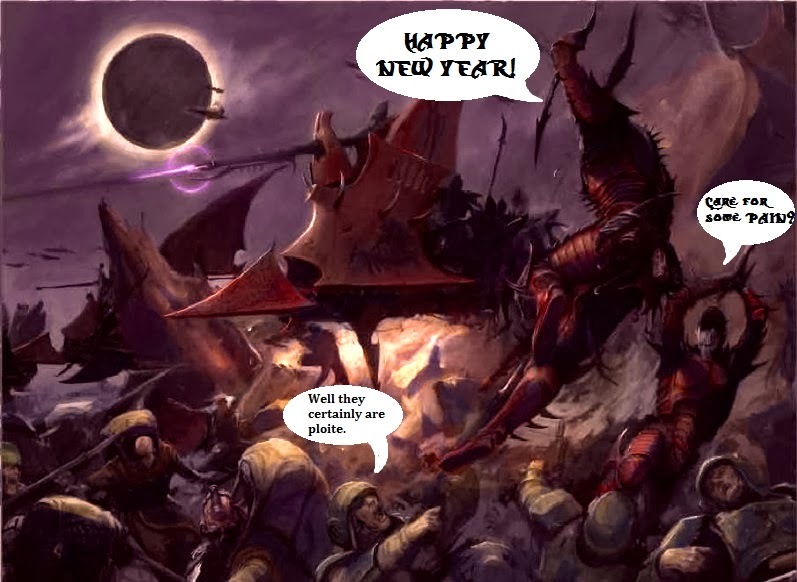 As the Xenos moved forward, a little trick up the Imperial Guard's sleeve was revealed. As the Mandrakes moved up to continue their onslaught, a claymore mine was triggered, blasting debris up from the ruins. Several were caught in the blast, including the grotesque Homunculus. However the agile nature of the xenos kept them from suffering any wounds from the trap. 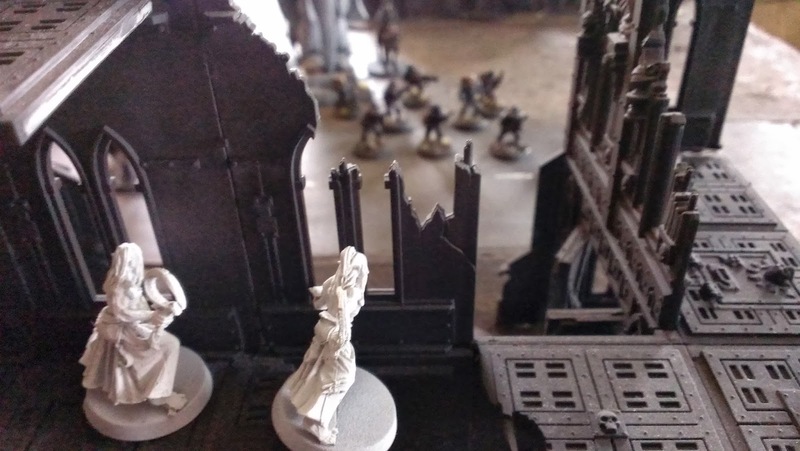 With the blast distracting the xenos for even the briefest of moments, the Imperial guard were ready to capitalize on the blast. The entrenched unit in the forward bastion opened fire on the exposed Dark Eldar warriors. Before they could react, one was caught in the fire. Though the Imperial Guard were ready to lay a continued barrage of suppressing fire, their volley was silenced. Crushing the last of the Death Riders, the Wraithknight leveled it's Sun Cannon and utilizing the laser sighting from it's shoulder weapon, landed a barrage of massive blasts into the exposed side arch of the troops atop the bastion. Even though their cover was impressive, the sheer power and volume of damage unleashed removed every last human soul from the point. With the Imperial Forces routed, the combined power of the Venom transport, the Wraith units, and the Trueborn destroyed the last remnants of the Imperial Guards forward infantry units. The Dark Eldar Warriors pushed for another attack on the heavy weapons teams trying dispiritedly to feel the damaged Wraithknight. With a hail of close range fire, the warriors laid into the infantry, ripping their bodies apart with shards from their splinter rifles, crippling them in agonizing pain. 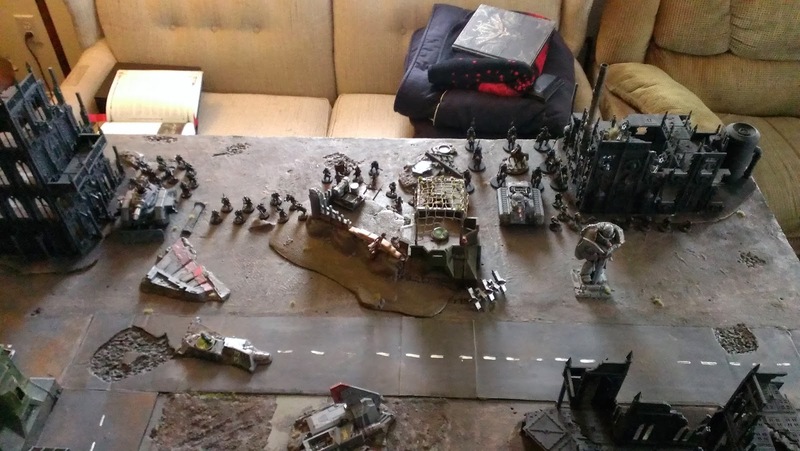 On the far right flank, the remnants of the Command Squad, having been hit by Wracks and losing their company commander to a round from the Ravager's remaining crew left the unit alone. Falling back into the Basilica, they made their final stand in the remnants of the great structure. Although the Wracks pushed through, and swept the unit in a brutal assault, the unit's Banner of Martyrdom only served to bolster the units resolve as they fell. 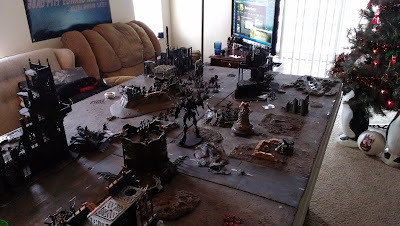 The Dark Eldar won a crushing victory over the Imperial Guard. 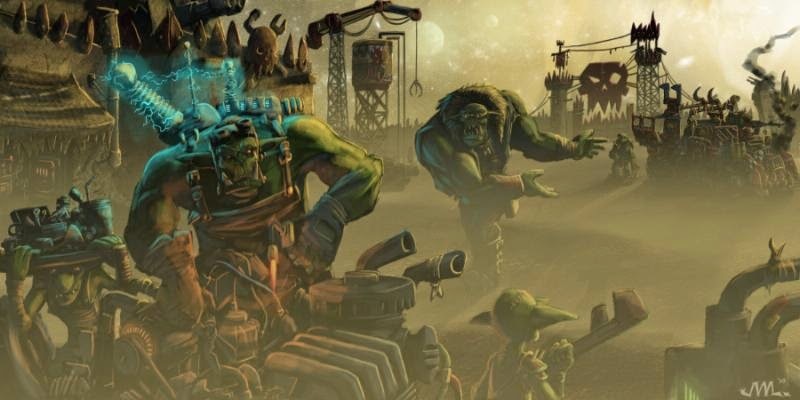 Suffering only a few casualties, the above units managed to continue sweeping through the devastated streets of the ruins, collecting more slaves and then vanishing without a trace. So in the end, the dice were totally on the Dark Eldar's side. And beyond anything it was a fun time to just throw dice against myself, and reacquaint myself with my armies. If you look very closely at the pictures, you may get a glimpse at something to come for Rites of Battle. If nothing else, I'm excited for it. I hope the battle was fun to read, and as something to learn from, playing a game against yourself is a good way to test your own skills. Once upon a time I wrote an article on it. Check it out if your interested in more on that point. Death to the Imperium of Man! I recognize some of those trueborn! Go DE go!